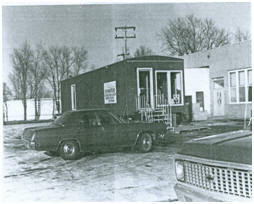 NOTE: The establishment of the mobile units is outlined in a 1975 three panel brochure, the author of which is unknown. In 1973 E.B. Oleson, Director of South Dakota Vocational-Technical Education, presented the idea for an Occupational-Vocational education program to the eight superintendents from northwestern South Dakota. It was explained that Federal “exemplary money” was available for an experimental project and the purpose of the project would be to introduce occupations and provide skill training in Vocational education to rural area residents. Because of the vastness of the area the vocational services should be delivered to the students. An initial proposal was submitted for 3 mobile-vocational classrooms with future plans for a total of nine mobile units. 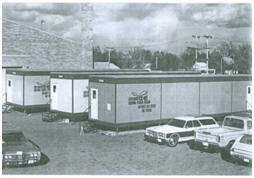 The first three units were completed and delivered in the fall of 1973 at a cost of approximately $50,000 per unit. 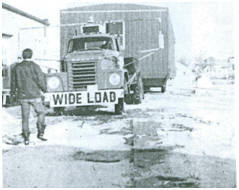 In January of 1975 three additional mobile vocational classrooms were implemented into service at a cost reduced to approximately $30,000 per unit. The savings of about $60,000 is attributed to the designing, equipping and curriculum development of the units by the Northwest Area Schools staff. Also, all construction and contracting was completed within the state of South Dakota.